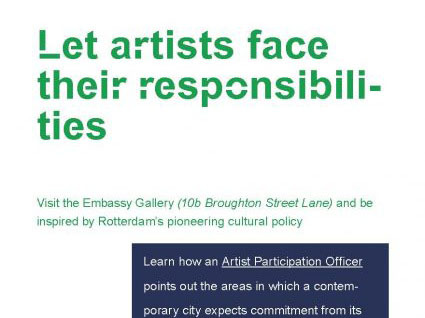 The City of Edinburgh will be the first to host an international promotion event of Rotterdam's innovative cultural policies for enforcing the participation of artists in heightening a city's competitiveness and securing social peace on the local level. 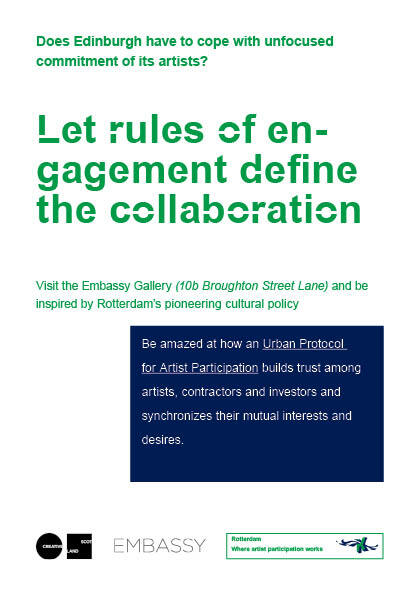 The City of Edinburgh will be the first to host an international promotion event of Rotterdam’s innovative cultural policies for enforcing the participation of artists in heightening a city’s competitiveness and securing social peace on the local level. 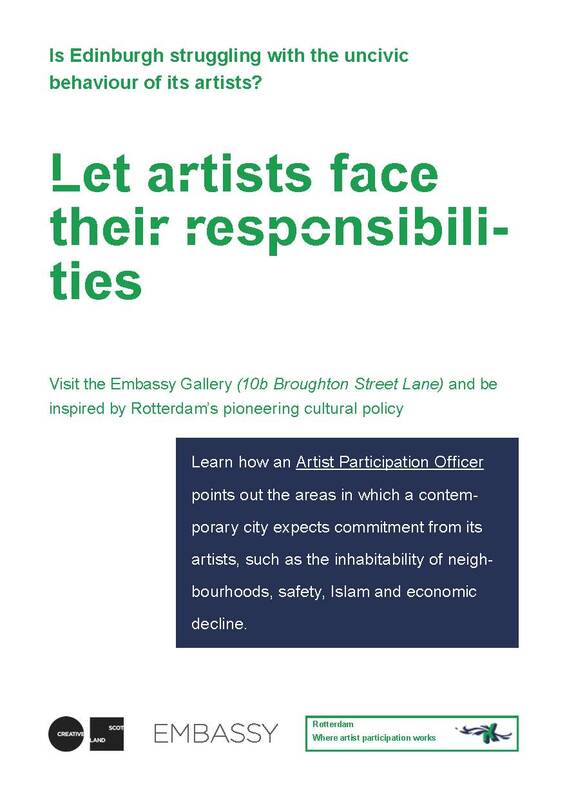 Over the past year, the task force for artist participation has succeeded in getting its innovative policy ideas generally accepted not only in political circles in Rotterdam but also in the Netherlands’ national government. 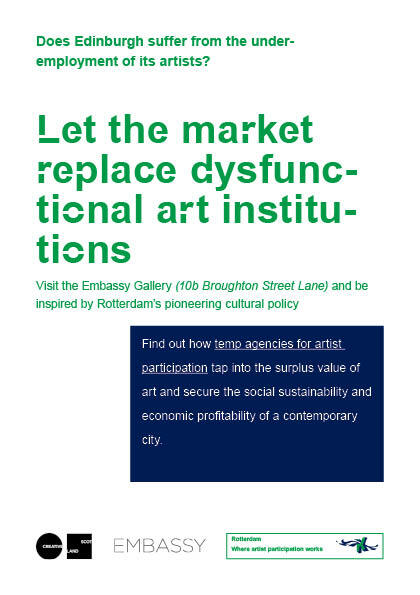 Now it is high time to familiarize the rest of Europe with its unique and effective approach towards enforcing the participation of artists in the strategic social, economic and spatial plans of a city. For this purpose, the Office for Artist Participation has prepared a special promotion package consisting of a PR brochure, posters and adverts. The latter can be used by cities all over the world to start up the process towards developing more effective ways of enlisting artists for societal goals. The package can be downloaded on the website of the Office for Artist Participation. The first international promotion event will take place in Edinburgh. An information stand will be set up in the Embassy Gallery, one of Edinburgh’s most avant-garde art spaces, for the duration of their upcoming exhibition ‘Going Public’. There will be several information and work sessions with Edinburgh’s most important local stakeholders including both artists, representatives of Edinburgh’s main art institutions as well as policy makers. For more information you can consult the website.